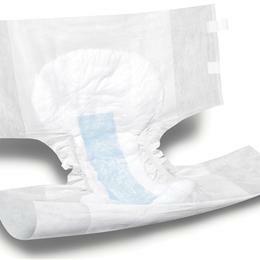 Breathable Adult Disposable Brief: Absorbent Core With Blue Acquisition Layer Keeps Moisture Away From The Skin. Cloth Outer Cover Is Comfortable Against Skin Helping To Prevent Irritation. Breathable Side Panels Reduce Heat And Increase Comfort. Grab Anywhere Closure System Is Gentle Against Skin. X-Large.